No More Made-In-Japan Toyota Vehicles in the United States? “Made in Japan” is a stamp of honor worn by many Toyota vehicles in the United States. For decades, vehicles built in the Land of the Rising Sun were synonymous with quality and known for exceptional build quality. That’s still true today, but a future is in sight when all Toyota cars sold here in the U.S. will have also been built in North America. What would that mean for the definition of a “domestic car”? Would Toyota’s reputation for quality remain as strong? This is nowhere near a done deal, but considering the vast majority of Toyotas sold here are already built here, it’s a possibility that should be taken seriously. Currently about 70 percent of Toyotas sold in the U.S. are built in North America. That includes the Avalon, Camry, Corolla, Highlander, Tacoma, Tundra, Sienna and RAV4. Models built in Japan are the Yaris, FJ Cruiser and Land Cruiser. The easiest way to make all Toyota vehicles sold here American-made would be to simply the discontinue the ones that aren’t. Really, would anyone miss the Yaris and FJ Cruiser? Didn’t think so. The Land Cruiser certainly has a loyal following, but maybe it could be the lone exception for import. The Prius, currently built in Japan, could have production shifted to the U.S. in 2015. Toyota has also expanded design and engineering centers, such as the CALTY styling studio near Los Angeles and its technical center in Ann Arbor. Last year, Toyota added or announced 3,500 new jobs and investment of $1.6 billion in North America. With so much engineering, design, manufacturing and investment in the U.S., when does Toyota stop being a foreign brand? 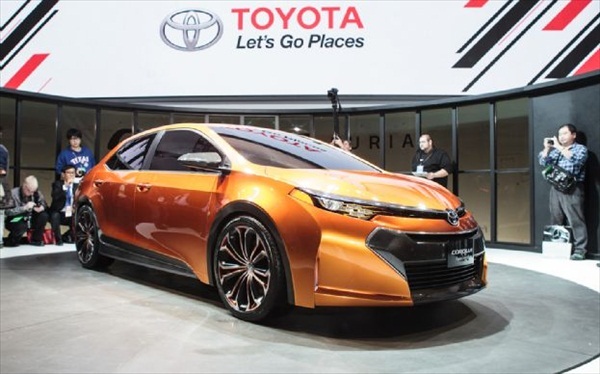 This entry was posted in Car Industry News, Car Minded, Car Politics, Domestic Cars, Foreign Cars, General Chat, United States and tagged north american auto production, Toyota, us auto production. Bookmark the permalink. I’d hate to be the one to buy an American made Toyota the day after the Super Bowl or any well celebrated US holiday or event. There will be too many hungover workers on the assembly lines doing poor quality work. That **** doesn’t happen in Japan. in 2016 and that is right around the time that the US and Mexico had the production of these vehicles increased by Toyota.Japan just doesn’t have the Real Estate to keep building the vehicles there. My next vehicle will be a Toyota 4Runner and if not in time to buy a new one from Japan, I will definitely go used. There is a lot of crap sold here presently……Nice crap……and Expensive Crap…..but still crap! But we the consumer keep thinking we can have something for nothing – only buy proven high quality vehicles – letbthecrest of the crap set on the lot till it’s discounted Down through the basement – then if you must – buy it use it and remember The deal when it doesnt last ! I have a 2011 RAV4 v6 and it was made in Japan….serial number is a “J” it’s a sports car and is so damn quick some of my passengers freak a little as I merge or pass vehicles that present a bit of a challenge to some…..zoom and were gone…..it’s black, is cool looking except I hate the interior which is grey ****** color….but Wexford Toyota didn’t get mine that I requested with leather…..but I took it anyway…..still has the original Japanese battery all the installed mechanicals like AC…alternator….shocks…..everything….it’s tight and the ride is very firm. It came with all synthetics and is maintained that way today. Can the grille design get any less homely, and impractical/vulnerable, from a durability standpoint? Does anyone know where the Toyota CHR was made? What I’m reading I hope in Japan as it seems it’s a better built car if made there. The current Toyota Yaris is made in France and has been since around 2013-2014. The Scion/Toyota iM (Corolla hatchback) is still made in Japan, but likely won’t be with the next-gen (2019?). Does anyone know the year that Japan stopped making Corollas in Japan? Toyotas of recent manufacture made in Japan: All Scion, 4Runner, FJ Cruiser, Land Cruiser, Prius, Yaris, Lexus. I agree with Sam. My 1997 Camry has 215,000 with original front struts,alternator and muffler. Its a beast. My 2012 hybrid made in Tennesee on the other hand has had the front bumper come loose within weeks, air conditioning smells like old gym socks, and now at 37,000 is burning oil. If i wanted junk i would buy a Ford. When they started making them in the USA the quality went away. How do you know that the finger should be pointed at Ford for the havoc of downgrading the quality of Toyota products when Ford is suffering from the same quality degradation problems from lending responsibility of the production of their Ranger to the easterners (who also have that level of prestige that is used to tarnish the good reputation of Ford as it is only an ambassador)? The only vehicle manufacturing company I know that has no vehicles that are only made in foreign countries (and let alone are dwindling in quality worth) in the present is Dodge. Completely agree with others who is don’t want to by a Camry with Dodge quality. That is the only reason I’m not giving up my old Camry. Think about it, you you want people to spend money on new car – give them desired quality. My 1997 Camry was made in Japan and has 215000 miles and original front struts,alternator, as well as muffler. Still drives better than most new American made junk. If I’m paying for a japanese made car I want one actually made by the japanese. If I want junk ill buy dodge. The Toyota 4runner is still built in Japan, this wasn’t mentioned in your article. Thanks. No, Toyota is saying, if you want made-in-Japan quality, spend at least 20k more and buy a Lexus.